American Creation: Triumphs and Tragedies at the Founding of the Republic by Joseph J. Ellis, Vintage Books, 2007, 283 pp. I know that Joseph Ellis can be a controversial figure, respected by some academics and disdained by others, criticized for his histories of “great men” without much attention to the concerns of women or non-white individuals. I do not know enough about the history to judge the quality of his research, but I thoroughly enjoy the stories he tells and the ways he explores the intersections of the founders of the Revolutionary generation. This is the fourth Ellis book I’ve read, and each one has taught me another layer of the Revolutionary era history while engaging interesting questions and inviting me into a fascinating story. 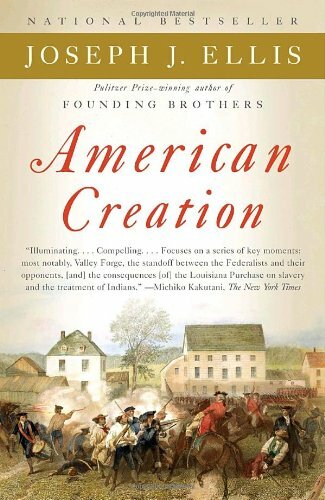 American Creation focuses in on several key events that were turning points in the choices the Revolutionary generation made, both bold and compromising. In response to questions and critics, Ellis ponders how and why the founders managed to set a new way of government based on soaring rhetoric of liberty, even while failing to address the glaring gap between their principles and the harsh realities of slavery and Native American relocation. As is typical of his other books, Ellis argues that key circumstances and personalities joined together at critical moments to change history. He begins by looking at the year between the Battle of Lexington and Concord in spring 1775 and the Declaration of Independence in 1776, arguing the necessity of an “evolutionary revolution” to give an opportunity for reconciliation with Britain to fail and therefore unite the colonies behind the idea of independence. The second chapter looks at the fateful winter at Valley Forge. Ellis argues that the experience of disorganization and deprivation endured by troops at Valley Forge sowed the seeds of federalism (especially for Washington and Hamilton), because the later federalists came to see the impossibility of relying on competing states to fulfill their obligations voluntarily. Valley Forge also altered the military strategy to focus on managing the countryside, not just fighting key battles. Subsequent chapters address the argument for a new constitutional convention to replace the Articles of Confederation and Madison’s developing sense of the new Constitution; the failure of treaties with the Native Americans to stop further settlements of European Americans on the frontier, and the recognition that the newly formed government did not have sufficient power or will to enact justice; the development of a two-party political system after the Federalist Papers and the corresponding change in position by James Madison; and the way Jefferson’s handling of the Louisiana Purchase sealed presidential power even while he claimed to abhor it. Ellis has another work of readable, engaging history here in American Creation. If you are a history buff or, like me, always fascinated by the Revolutionary generation, you will find plenty of interest here, and a fun book to read.